Apparently I'm a blue person. My old room was a horrendously light shade of blue, so I painted it a darker blue. It turned out too dark, however; this time around, I chose a better shade of blue--more blue grey, slightly lighter. My coworkers at the art gallery suggested doing three walls in a natural brown and having a blue accent wall, but I was too timid to follow up on this recommendation; I stuck with blue. What was originally a one-man operation became a one-man-and-twins operation when my friends Cassie and Carly offered to help paint. I didn't even have to ask! ((Of course, buying them each an xkcd t-shirt for Christmas might have had something to do with it.)) I woke up early that morning and moved most of my furniture out of my room. 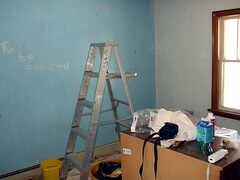 Then I washed the three walls without wallpaper before tackling that last, fatal wall. I canna give her any more, cap'n! I've been very happy with my Dell Inspiron 6400 laptop since purchasing it over a year ago. I bought it online, customized it to meet my needs, and this lovely machine has performed without complaint. There's a chip on the lower left edge of the white trim; I'm not quite sure how it got there. And I had to replace my keyboard once--Dell support was very helpful and shipped one to me by the next day.